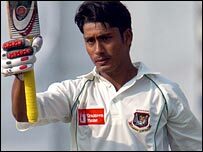 Mohammad Ashraful hit his third Test century as Bangladesh scored 300 in a day for the first time, in the first Test against Sri Lanka. Ashraful hit a brisk 136, with 15 fours and three sixes, but none of his team-mates could better Nafees Iqbal's 34 as they finished day one 315-9. Leg-spinner Malinga Bandara took two key wickets just before lunch. And Muttiah Muralitharan, playing in his 100th Test match, took three wickets in a marathon 31 overs. Shahadat Hossain (12) and Enamul Haque (one) were the not out batsmen at the close. Ashraful, who slammed a century on debut against Sri Lanka in Colombo in 2001, once again showed his liking for their bowlers as he played both pace and spin with ease. He reached three figures, in his 30th Test with a lovely pulled four off paceman Lasith Malinga. Ashraful was involved in two useful partnerships that boosted the total after Bandara had pushed them on to the back foot. He added 65 for the fourth wicket with Shahriar Nafees (27) and dominated a 64-run stand for the fifth with former skipper Khaled Mashud, who scored just six off 50 deliveries. Mashud, next man Alok Kapali (16) and Ashraful all fell in the last session to Muralitharan. Ashraful finally lofted the star spinner towards mid-wicket, where Upul Tharanga took a well-judged catch. Earlier, Bandara bowled Nafees off the last ball of his first over and then trapped captain Habibul Bashar (29) lbw with the first ball of his next.